Whether temporally or spatially focussed, nostalgia results from a division between what is longed for and the moment of longing. This article examines this “nostalgia gap” alongside the analogous gap found in representation. The relationship is highlighted via an analysis of “holiday records”, a genre of recordings that became prevalent in the 1960s. The genre intersects with the more familiar genres of exotica, mood music, easy listening and ambient, but is distinguished by its emphasis on a particular form of spatial reminiscence and imagination. Using the example of “April in Portugal”, a song that started life as a Portuguese fado and subsequently became an international hit and mood music staple, I address a set of questions that illustrate the nostalgia gap. What is being remembered or imagined in the song? Can we distinguish between described and prescribed nostalgia? How is saudade, the specifically Portuguese “grammar of nostalgia”, related to nostalgic languages found on other holiday records? Qu’elle se rapporte au temps ou à l’espace, la nostalgie naît d’un écart ou fossé entre le passé que l’on désire retrouver et le moment présent du désir. À travers cet article, je me propose d’examiner le « fossé nostalgique » et le fossé de représentation. La dynamique est explorée à travers une analyse des « disques de vacances », un genre d’enregistrements devenu très en vogue dans les années 1960. Le genre se situe à la croisée des genres plus connus de l’exotica, mood music, easy listening et ambient, mais s’en distingue par l’usage spécifique qu’il fait de réminiscences géographiques et de faits fictifs. En utilisant l’exemple d’ « April in Portugal », à l’origine un fado portugais qui est par la suite devenu un tube international et un grand classique de la mood music, je réponds à une série de questions qui illustrent le fossé nostalgique. Qu’est-ce qui est effectivement remémoré, qu’est-ce qui est imaginé dans la chanson ? Peut-on établir une différence entre nostalgie « descriptive », tirée d’une expérience vécue, et nostalgie « obligatoire », ou clichée ? Quel genre de rapports la saudade, « bréviaire de la nostalgie » typique du Portugal, entretient-elle avec les types de langues nostalgiques que l’on peut trouver sur d’autres disques de vacances ? 1The history of nostalgia has seen the concept develop from a longing for home towards a more general longing for the past. Whether temporally or spatially focussed, nostalgia is fundamentally understood as resulting from a gap, a division between what is longed for and the moment of longing. This article examines this “nostalgia gap” alongside an analogous gap found in representation. The relationship is highlighted via an analysis of “holiday records”, a genre of recordings, prevalent in the 1950s and 1960s, specialising in the depiction of tourist destinations. The genre intersects with the more familiar genres of exotica, mood music, easy listening and ambient, but is distinguished by its emphasis on a particular form of spatial reminiscence and imagination. 2Nostalgia is often conceived as a look back across an unbridgeable gap and as therefore originating in, and being primarily of interest to, the present. As a complementary project, I want to focus on the role of representational distance in the creation of nostalgia and, conversely, in an ever-present nostalgic mode in the creation of representational distance. I am still interested in the “big gap” between now and then, here and there, but I use this as my destination rather than my starting point. To begin with, I consider the loss of meaning in the initial act of representation and then trace subsequent representational slippages through a metonymic chain of associated, increasingly distant thematic iterations. Place plays a prominent role here and, with this in mind, I have structured this article as a series of reflections on a song–“Coimbra”–that started out as a representation of a city before becoming–as “April in Portugal”–an international representation of a country and of a more general sense of nostalgic longing. 3The Portuguese composer Raul Ferrão wrote the music to “Coimbra” at the end of the 1930s but the tune lay dormant until 1947, when, with the addition of José Galhardo’s lyric, it was performed by actor and singer Alberto Ribeiro in the film Capas Negras. The film’s female lead was played by Amália Rodrigues (henceforth Amália, after the common usage), a rising star of fado in Portugal and abroad. Amália would become the preeminent fado singer of the twentieth century as well as the most famous Portuguese popular music artist internationally. “Coimbra” is introduced as a serenade delivered by Ribeiro’s character to Amália’s. The song is of a style that could be termed “associative” (Elliott, 2010: 67) in that it mainly consists of a list of features associated with the historic university city of Coimbra. Capas Negras is set amongst the students and faculty of the university and Coimbra is one of the main “characters” of the film, not only in the depiction of its scenery, but also in the constant references to the city throughout the film. The song “Coimbra” thus fits with this theme by hymning the “Coimbra of the Choupal [a tree-lined avenue] […] of songs […] of doctors” and declaring the city to be “the capital of love in Portugal”. 4“Coimbra” might have travelled no further, for it was not a significant hit with audiences. However, Amália maintained a fondness for the song and returned to it a few years later. Performing in Ireland in 1950, she met the French singer Yvette Giraud, who had two songs from Amália’s repertoire adapted to French by the chanson writer Jacques Larue. One of these was “Coimbra”, retitled “Avril au Portugal”, for which Larue provided a new lyric to Ferrão’s music rather than translating the original. The new song became a nostalgic glance back at a fleeting romance, voiced by a French traveller to Portugal. Giraud’s recording was a hit in France and the song’s popularity spawned other versions by Elyane Dorsay, Anny Gould and Yvonne Blanc. It was common practice at the time for music publishers (in this case, Chappell) to capitalise on a successful tune by having artists on different record labels record simultaneous versions. 5In 1952, following the success of “Avril au Portugal”, Chappell approached the Irish-born, New York-based songwriter Jimmy Kennedy to write an English version called “April in Portugal”, a title which was already being used by some orchestral arrangers of the tune. Kennedy took the job but refused the title, not wishing to be known as a writer of “geographical songs” (Kennedy, 2011: 204). Instead, he wrote a song called “The Whisp’ring Serenade”, whose lyric bore no mention of any place other than the moon and stars. The protagonist of the song recounts a tale of falling in love with a piece of string music, which comes to act as a surrogate for a lost lover: “old ecstasy returned / I lived and loved and learned / but then you went”. The song remained both a self-referential serenade and a tale of memory and longing, but all reference to Portugal had vanished. 7Amália did not miss out on the song’s popularity, appearing on Eddie Fisher’s American show “Coke Time” twice in July 1953 and performing a version of “Coimbra” that combined Galhardo’s original lyric with Kennedy’s. Over the following decade, more versions followed from Xavier Cugat (1957) George Melachrino (1958), Bert Kaempfert (1959), Manuel and the Music of the Mountains (1960), Bing Crosby (1961) and Joe Quijano (a “chachacha-twist” version from 1963). In 2004, the Portuguese record label Tradisom released a CD entitled Coimbra–April in Portugal–Avril au Portugal, featuring 24 versions of the song selected from a list of more than 200 known to compiler José Moças (Various Artists, 2004). In addition to a number of the aforementioned versions, the collection included others by Liberace, Caetano Veloso, and a version in Italian sung by Amália in 1974. 8With the possible exception of the more dance-oriented instrumental versions of “April in Portugal”, the one constant amongst the myriad recordings of the song is a sense of longing, what might be thought of as a network of yearning. This association begins with the original song, with its romanticised depiction of Coimbra, students, youth and love. As a city, Coimbra had long maintained such associations, not least through the tradition of black-caped male students serenading young women from outside their windows (the source of the “capas negras” of the film). In a 1931 review of fado recordings from Coimbra, the British folklorist Rodney Gallop was keen to connect text and context by describing the city, where, “[o]n full-moon nights you may see the students in their black gowns wandering through the dim white streets, and hear them singing to the silvery accompaniment of the guitarra the haunting strains of the fado chorado” (Gallop, 1931: 173). 9In writing about fado, it is deemed obligatory to mention the music’s association with saudade, the famous Portuguese word which, many attest, cannot be translated directly into English. As I have described elsewhere (Elliott, 2010: 27-9), there is a well-established debate surrounding the attempt to define this word, with variations of “nostalgia”, “yearning” and “longing” being by far the most common. Svetlana Boym suggests an interesting approach to defining saudade when she uses the word as one of a series of synonyms from other languages (a “grammar of romantic nostalgias”) which includes Sehnsucht, saknadr, saknad, Sawn, πόθος, nostalgie, anyoranza, morriña, Тоска, litost, tesknota and dor (Boym, 2001: 13). Following Boym’s line of thinking, I suggest that the proliferation of terms centred on notions of yearning, longing and nostalgia, coupled with the possibility to suggest some kind of synonymity, seems at odds with their untranslatability; instead, the untranslatability may be seen as a willed one rather than a purely linguistic one. 10“Saudade” is the final word in the lyrics of “Coimbra”, meaning that the song resolves with a direct reference to this typically Portuguese nostalgia. This, along with the song’s association with Amália, have led many to hear the song as fado. But is it? By mid-century, the growth of fado canção (“song fado”, a pop-influenced development of traditional fado forms) had made distinctions between fado and other popular styles blurry, and Amália was at the forefront of experimentation with the genre. Instrumentally, however, there is more constancy to fado. Whether in the Coimbra or Lisbon style the presence of the guitarra portuguesa is considered essential. So it is interesting to note that, although Alberto Ribeiro is shown playing a guitarra while he sings “Coimbra”, he is not heard doing so; the music is provided by orchestral strings and is non-diegetic. When Amália adopted the song in her subsequent concerts and recording sessions, the guitarra returned and she typically performed it in a conventional trio style (voice, guitarra and viola [Spanish guitar]). The vocal style, too, could be heard as fado–Coimbra-style for Ribeiro, who stays closer to bel canto; Lisbon style for Amália, who offers a typically grainier vocal–though there is often potential vocal slippage between fado and other styles. Ultimately, the song became a fado partly because of its centrality in Amália’s “Portuguese” repertoire (as distinct from the rancheros, flamencos, chansons, Hollywood show tunes and canzone Napoletana that she also performed) and because, despite her versatility, Amália was generally presented as a fado singer. 11“Coimbra”, then, is connected with fado (albeit problematically) and engages, from its first airing onwards, with a nostalgic reduction of the city from which it takes its name. If the song were to have no connection to the city or to fado, its persistence as an emblem of both would be compromised. Mythological and nostalgic accounts require a believable level of representational accuracy to maintain their currency and the gestures towards fado practice and spatial representation are significant here. As “fado”, “Coimbra” establishes a semiotically meaningful way of performing place, summoning up a mythology that traces the remembered and imagined city of the past in a poetics of haunting. 12The peculiar destiny of “Coimbra” has already been outlined. Now it is time to consider how some of the aforementioned versions of the song take on the baton of nostalgic representation and, through further slippages, produce new meanings. Of the early non-Amália versions of “Coimbra”, Les Baxter’s might, surprisingly, be considered the closest to fado in that it uses what Baxter later recalled as “Brazilian mandolin” (quoted in Toop, 1999: 131). The instrument, presumably a bandolim, is heard providing the melody in the first part of Baxter’s “April in Portugal”, before the tune settles into a more conventional string arrangement. It is both “exotic” and indexically linked to Portugal and the guitarra portuguesa due to the similarity of the bandolim’s tone and playing style. Baxter would later claim that the style he adopted for “April in Portugal” provided a template for much of his subsequent work (ibid. ), though that work would aim at representing far more mythically fantastic and unreachable locations than the Iberian Peninsula. Indeed Baxter was a pioneer of the exotica style that would be taken up by musicians such as Martin Denny, Arthur Lyman, Yma Sumac (with whom Baxter worked) and Juan Esquivel (who himself produced a startlingly arranged “April in Portugal” on his 1958 album Four Corners of the World). 13Baxter’s version of the song did much to establish it as an instrumental standard and numerous other bandleaders and arrangers would incorporate it into their repertoires. In 1953, Percy Faith included “April in Portugal” on an EP entitled Percy Faith Plays Continental Music. It can be taken as a sign of how widely Ferrão’s “fado” melody had travelled by this point that the liner notes describe Faith’s arrangement as “unusual, in that it slides over the customary tango setting and reverts to the original conception, with an interesting role assigned to the percussion” (liner notes to Faith, 1953). Quite what this “original conception” is remains unclear, though the use of military drums throughout the arrangement signals that it has little to do with fado, which almost invariably omits percussion. Also of note from the title of Faith’s record and its liner notes is the use of the term “continental music”. The notes maintain that “not until very recently has the European song had much success in America”, but that, “with the success of The Song of Moulin Rouge, April in Portugal and Anna, at substantially the same time, an interest […] sprang up”. They conclude with the observation that “the grace and sophistication, the cheerful zest, the sweet nostalgia of these songs show that for years Americans have been overlooking a rich and inexhaustible source of melodic refreshment” (ibid.). We can assume the same process of distanciation and curiosity in Britain (for whom “Europe” and “the Continent” remained a neighbouring “other”) from the establishment, by the 1950s, of a regular feature in Gramophone magazine devoted to “continental records”. 14The marketing of music as “nostalgic” was a common feature of the time and signalled one of the ways in which musical representations could (and, I argue, still can) be heard as a kind of prescribed nostalgia–as intentionally nostalgic–rather than as functioning only as objects of nostalgia. It is not that the latter relationship was, or is, immaterial, but that the understanding of music as itself representative of nostalgia is one that is often overlooked in the desire to focus on listeners in search of lost tones. 16As stated earlier, effective myth relies on some connection to reality. Amidst the fairly typical hyperbole, then, we find untruths (Baxter was not a great traveller and, by other accounts, never left North America), half-truths (Chappell had recognised the hit potential of “April in Portugal” before Baxter’s recording) and reasonably accurate information (Baxter did indeed adapt his myriad influences to his own style, making for a certain uniformity to his music, or an artistic vision, depending on one’s view). Accuracy, as ever, is one of the first things to be sacrificed on the altar of hype and the distance between fact and fiction is but one more element in the “nostalgia gap” being highlighted here. “This album comprises a collection of some of the most popular and delightful music of and about Portugal […] authentically interpreted in the lush orchestral style of Bert Kaempfert and his orchestra. To the encyclopedist Portugal is a republic in the south-west part of the Iberian peninsula–the world’s largest producer of cork; according to the travel bureaus, it’s a tourist mecca; to the Portuguese themselves, it’s home sweet home. 18It is difficult to recognise the authenticity of which these notes speak given the distance between the sound of Portuguese music and what Kaempfert offers. As with most Kaempfert albums, it is easy to connect the melodies to their well-known vocal or instrumental originals, yet the similarity of style removes rather than revives the original texts and contexts (a process amplified on this album by the prominent use of Spanish guitar and castanets, providing a sonic dislocation to a non-Portuguese “Latin-ness”). The liner notes, meanwhile, read as though they have been written by someone with little or no experience of Portugal. Reference to “the encyclopedist” may be a rhetorical device, but it also suggests that the writer has merely gone to an encyclopaedia for information. This experience of the world from a distance would appear to be connected to the aims of the music, with listeners being invited to “close your eyes and listen” (ibid. ), suggesting that the journey to be taken is a virtual one. 19Kaempfert was an exponent of what has been termed “mood music” and “easy listening” and can be distinguished, to a certain extent, from exotica artists such as Baxter, Denny and Lyman. His style is shared, to an extent, by other orchestrators such as George Melachrino and Geoff Love, both of whom recorded versions of “April in Portugal”. Melachrino was an artist associated with mood music due to a series of albums he produced that were geared towards specific functions, including Music for Dining, Music for Reading, Music for Courage and Confidence, Music for Daydreaming and Music for the Nostalgic Traveler, the last of which included Ferrão’s tune. Melachrino returned to the piece on Lisbon at Twilight, a 1958 album which contained twelve instrumentals based on Portuguese themes and arrangements of fados. Intriguingly, the album also featured the Portuguese guitarist Raul Nery, a composer in his own right as well as being an accompanist to many major fado singers such as Amália. Nery, who flew to London to record with Melachrino’s orchestra, contributes two compositions to the album, and provides guitarra accompaniment (and lead) to all the tunes, including “April in Portugal”. The liner notes, which describe fado as “nostalgic little ballads telling of death, disappointment, drownings, stabbings and general heartbreak”, give a generally accurate account of fado practice (addressed to an American audience, despite the album’s UK provenance) before observing that Melachrino’s record will cost “approximately $450 less than the round-trip economy-class air fare between New York and Lisbon” (liner notes to Melachrino, 1958). 21By focussing on the representational gaps in versions of “April in Portugal” by Kaempfert, Melachrino and Manuel, we can see how notions of “Portuguese-ness”, “Latin-ness” and more general “foreign-ness” are vital aspects of the music’s meaning and the way it is presented to an assumed Anglo-American public. By the time of the tune’s assent into easy listening ubiquity, the development of jet travel was opening up new possibilities for tourists, a process reflected in popular music via albums like Frank Sinatra’s Come Fly With Me (1958), Mantovani’s Continental Encores (1959), Bing Crosby’s Holiday in Europe (1962) and Tony Bennett’s If I Ruled the World: Songs for the Jet Set (1965). Often, such albums would present themselves as tourist itineraries: the rear cover of Come Fly With Me depicted a “flight plan” (the songs), a “flight log” (notes on the songs) and listed the pilots as Sinatra, Billy May and Nelson Riddle, while If I Ruled the World had a similar table on the rear jacket listing “Departure […] Notes […] Destination […] Time”. Mantovani’s Continental Encores was a particularly lavish affair, a genuine “album” in that its gatefold cover incorporated an eight-page booklet featuring colour photographs of European tourist destinations (complete with glamorous young tourist couples) and gushing notes describing the “journey in sound” contained on the record: the combination of music and recording technology, we are told, can bring Europe into our living rooms, or “to put it another way, it can now be employed to take you out of your home, and lead you gently by the ear to familiar or imagined places” (liner notes to Mantovani, 1959). 22Like the use of glamorous locations in films of the period, this type of holiday album presented itself, above all, as an account of something that other, more sophisticated people were doing, or that gifted musicians could make you believe you could do. These were other people’s holiday albums, which listeners were invited to peruse and to imagine being a part of. While a review of the 1965 compilation Holiday in Portugal spoke of the “holiday madness” of that year and suggested that the record would prove popular with returning holidaymakers, it was equally understood that the record might stand in as a substitute for the actual experience of travelling (Gilman, 1965: 126). “Of course, the comparative ease of Continental travel these days has helped to introduce us to French, Italian and German tunes which in the ordinary way might never have reached these shores had they not been stowed away in the memories of English holiday makers, wistfully returning from unimagined sunshine. 24Here, recourse is made both to experience and to fantasy, to actual and virtual travel. Another way these aspects were combined was in the use of bands at UK holiday camps to provide nostalgic music appropriate for holiday moods. 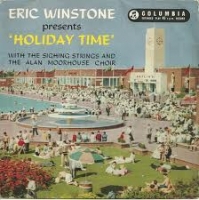 One such bandleader, Eric Winstone, released an eight-track EP in 1958 entitled Holiday Time, made up of two sections: “Holidays at Home” and “Holidays Abroad”. Once again “April in Portugal” was included, leading off a medley of choral and orchestral arrangements that included “Wonderful Copenhagen”, “Vienna City of My Dreams” and “Arrividerci Roma” [sic]. The liner notes referred to the “carefree, happy-go-lucky atmosphere” and to Winstone’s “long-established reputation for creating and dispensing happiness, nostalgia and escapism” (liner notes to Winstone, 1958). 26Indeed, it can be hard to distinguish between Muzak, mood music, easy listening, exotica, space-age bachelor pad music, lounge and holiday records; they all constitute Lanza’s “murky miscellany”. Like Les Baxter, mood music outfits such as The 101 Strings and the Mystic Moods Orchestra went for feeling and mood rather than authenticity, providing an explicit fakeness, a refusal to be enslaved to the aura of the original even as something auratic was being promised. The basic sonic template for all such groups was interchangeable from the representation of one locale to that of another. 27That said, authenticity in the holiday record is slightly different to that found (or avoided) in exotica records in that it aims for a representation that may, especially in the souvenir record, feature “authentic” instruments, styles and songs. The authentic “sampling” experience is as important for this type of record as the menu in an international restaurant and it is perhaps this aim for truer representation (no matter how ineffective) that leads Rebecca Leydon to describe the music of bandleaders such as Kaempfert and Winterhalter as only “pseudo exotic” (Leydon, 1999: 63). Holiday records present the exotic, but not the kind of spectacular exotic associated with Baxter, Denny, Lyman and Sumac. Where exotica indexes impossible fantasies beyond the borders of the wildest orientalism, holiday records showcase reachable but romanticised destinations, even as they often settle for armchair representation. Where exotica focuses on the fantasy of adventure and the nostalgically misremembered dangers of elsewhere, the holiday record trades in the possibilities of leisurely travel and tourism and in cultural misrepresentations of a more modest kind. 28What this suggests for the study of nostalgia is that, just as there is representational slippage between actual and virtual tourism, between places and the representation of places and between vacations and their evocation, so there exists a nostalgic slippage between described nostalgia and prescribed nostalgia, as though nostalgia was something pre-programmed into us and available by affective triggers other than those of directly lived personal experience. Put another way, nostalgia triggers play on the kind of recognised “universal” experiences we can all tap into, even if we have to then map them onto personal experience. There is also a metonymic slippage that takes place between the associations conjured by music, memory and place. Melachrino’s Lisbon at Twilight taps into the equation of twilight with reflection, while all versions of “April in Portugal” arguably tap into a metonymic chain that connects April to romantic reflection, to remembered Springs, to Paris, to love and to a fixed perfect moment. This was one of the reasons Jimmy Kennedy had been loath to write the song (he felt it would be associated with the famous “April in Paris”), but it was also, no doubt, one of the factors in its success. 29There are other stories to be told about holiday records, not least the way in which they may themselves become objects of nostalgia in the way that lounge and exotica records did in the 1990s (Anderson, 2006, Taylor, 2001). Certainly, despite the occasional lavish products released by the culture industry, one cannot easily imagine something like Mantovani’s Continental Encores being released now; as an object seemingly forever indexed to the past, it has a nostalgic mystery to it. For all its potential nostalgia, however, it and other such records are “exhausted commodities” (Straw, 2000), objects that have mostly been moved on from the homes in which they once “lived” to charity shops or elsewhere, becoming “homeless” objects in a way that seems to mock their once brazen attempt to sell the pleasure of travel. 30The next tale to be told might be the one many writers on exotica have already told, the potential to revisit these items as items of “reflective nostalgia” (Boym, 2001), examples of what culture discarded on the road to canonising other tastes (Vale & Juno, 1993, 1994, Hayward, 1999). It would also be interesting to explore notions of kitschiness and abjection along the lines explored by theorists of popular culture and collecting (Olalquiaga, 2002, Stewart, 1993), for it is certainly the case that a number of the records mentioned in this article are items of abjection to a far greater extent than the now rather collectable exotica of Baxter, Denny and Lyman. Then there are questions of the extent to which these items might be seen to present a nostalgic reflection on leisure time itself, of travel and a certain (mis)understanding of the world. 31Here, I have settled for an attempt at highlighting the representation gap between place and its evocation, which I argue is constituted via a nostalgic mode. Holiday records are representations of nostalgia, especially when considered as whole packages (including liner notes, covers and marketing). They may be more important as representations of a general nostalgia than as souvenirs of particular experiences. The tourists depicted in the sun-drenched pages of Mantovani’s Continental Encores represent a general index of youth, travel, cosmopolitanism, wealth and leisure, but also a nostalgia for a time when this might have been possible; this is evident now but I suggest that it was evident even in 1958. 32In addition to widening the gap between the original musical representation of a city and its object of nostalgic desire, one of the effects of the multiple derivations of “April in Portugal” was to render versions of the original Ferrão/Galhardo song into authentic fados due to their proximity to the source. Thus, a 1965 compilation entitled Holiday in Portugal could claim to present authentic examples of fado despite the addition of an orchestra, while the semi-ethnomusicological imprint Monitor (later to come under the administration of the Smithsonian Institute alongside the more famous Folkways label) could release a collection of fados in 1962 under the title April in Portugal. Anderson Tim J. (2006), Making Easy Listening: Material Culture and Postwar American Recording, Minneapolis, University of Minnesota Press. Boym Svetlana (2001), The Future of Nostalgia, New York, Basic. Elliott Richard (2010), Fado and the Place of Longing: Loss, Memory and the City, Farnham, Ashgate. Gallop Rodney (1931), “Some Records of the Portuguese Fado”, The Gramophone, No. 101 (October), p. 173. Gilman William (1965), “Continental Records”, The Gramophone, No. 507 (August), p. 126. Hayward Philip (ed.) (1999), Widening the Horizon: Exoticism in Post-War Popular Music, Sydney, John Libbey. Kennedy Jimmy J. (2011), The Man Who Wrote The Teddy Bears’ Picnic, Milton Keynes, AuthorHouse. Lanza Joseph (2004), Elevator Music: A Surreal History of Muzak, Easy-Listening and other Moodsong, London, Quartet. Leydon Rebecca (1999), “Utopias of the Tropics: The Exotic Music of Les Baxter and Yma Sumac”, in Hayward Philip (ed. ), Widening the Horizon, Sydney, John Libbey, pp. 45-71. Olalquiaga Celeste (2002), The Artificial Kingdom: On the Kitsch Experience, Minnesota, Minneapolis University Press. Stewart Susan (1993), On Longing: Narratives of the Miniature, the Gigantic, the Souvenir, the Collection, Durham, Duke University Press. Straw Will (2000), “Exhausted Commodities: The Material Culture of Music”, Canadian Journal of Communication, Vol. 25, No. 1, available at: http://www.cjc-online.ca/index.php/journal/article/view/1148/1067 [Accessed 15 February 2013]. Taylor Timothy D. (2001), Strange Sounds: Music, Technology and Culture, New York & London, Routledge. Toop David (1999), Exotica: Fabricated Soundscapes in a Real World, London, Serpent’s Tail. Vale Vivian & Juno Andrea (eds.) (1993), Incredibly Strange Music, Vol. 1, San Francisco, Re/Search. Vale Vivian & Juno Andrea (eds.) (1994), Incredibly Strange Music, Vol. 2, San Francisco, Re/Search. Baxter Les (1955), Kaleidoscope, LP, Capitol T594. Bennett Tony (1965), If I Ruled the World: Songs for the Jet Set, LP, CBS 62544. Faith Percy (1953), Plays Continental Music, EP, Columbia B-371. Kaempfert Bert (1959), April in Portugal, LP, Decca DL881. Mantovani (1959), Continental Encores, Decca SKL4044. Manuel and the Music of the Mountains (1961), The Music of Manuel, EP, EMI/Columbia SEG8096. Manuel and the Music of the Mountains (1966), Blue Waters, LP, EMI TWO131. Melachrino George (1958), Lisbon at Twilight, LP, RCA SF5034. Sinatra Frank (1958), Come Fly With Me, LP, Capitol/EMI LCT6154. Various artists (2004), Coimbra – April in Portugal – Avril au Portugal, CD, Tradisom TRAD038. Winstone Eric (1958), Holiday Time, EP, EMI SEG7805. Richard Elliott, « “Time and Distance Are No Object” », Volume !, 11 : 1 | 2014, 131-143. Richard Elliott is Lecturer in Popular Music at the University of Sussex. He researches representations of loss, memory, nostalgia and space within popular music. He is the author of the books Fado and the Place of Longing (2010) and Nina Simone (2013) and is currently writing a monograph on the representation of time, age and experience in popular music. Richard Elliott est Maître de Conférence en Musiques Populaires à l’Université de Sussex. Ses recherches concernent les représentations de la perte, la mémoire, la nostalgie et l’espace au sein des musiques populaires. Il est l’auteur des ouvrages Fado and the Place of Longing (2010) et Nina Simone (2013), et écrit en ce moment un ouvrage sur l’expérience du temps et du vieillissement dans la musique populaire.